NEW BRITAIN - The last time the Innovation boys basketball team met MLC, it won by nearly 30 points. It turned out to be a little closer Friday night. 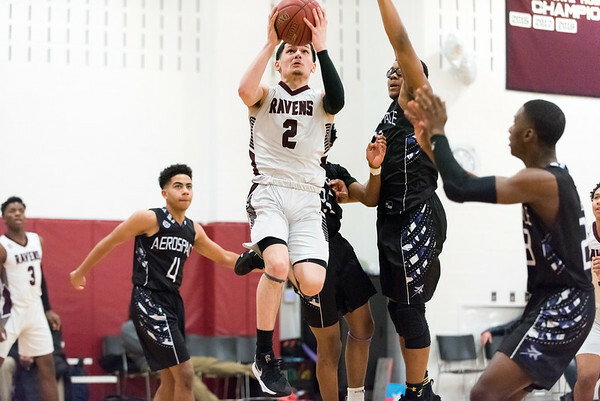 A 14-2 run in the third quarter gave the Ravens the boost they needed, as they soared past the Dragons 60-50. Innovation’s Carlos Gonzalez scored nine out of the 14 points in the run, including two 3s, while Linwood Hazelwood scored four points. Gonzalez led Innovation with a game-high of 21 points on the evening, while teammates Lenny Okonya and Hazelwood contributed a combined total of 21. Although the Ravens were able to keep a consistent lead toward the end of the game, the Dragons made them work for it. Halfway through the fourth quarter, MLC went on a 5-2 run to get within 18 points (54-39) and then had another 11-2 run to pull within six. But then, the Dragons fell into foul trouble during the final minute of the game, sending Innovation’s Ramiesh Bogle, Gonzalez and Lenny Okonya to the line. The Ravens capitalized with four points to help close the game out. MLC was able to get an early 4-0 run in the beginning of the first quarter, but not before Innovation would respond with an 11-0 run by Okonya and Malcom Lewis. But the Ravens quickly found themselves tied with MLC midway through the second quarter, setting the tone for what was going to be a closer contest than Innovation expected for the rest of the night. Malachy Campbell led MLC with 15 points with Jaden Walker adding 10. After both teams traded 3s towards the end of the second quarter, Gonzalez hit a 3 and Okonya made a slam dunk, giving the Ravens a 3-point lead (24-21) going into the break. It only set up for what was an even better second half. Posted in New Britain Herald, Innovation on Friday, 2 February 2018 22:46. Updated: Friday, 2 February 2018 23:14.